Modern understandings of child development recognize that it is shaped over time by a complex interplay of intrinsic child characteristics and multiple aspects of the environment. This has directed attention to the role of individual differences between children in influencing the way that parenting works. These differences range from basic attributes such as gender and health, to psychological factors such as temperament and cognition. Of these, the role of child temperament has received by far the greatest attention. While differences in temperamental dimensions, such as reactivity and self-regulation, directly impact on many aspects of social and emotional development, they can also interact with parenting in complex ways. This chapter focuses particularly on direct, bidirectional, and interactional relationships between temperament and parenting and their impacts on child outcomes, supporting the theoretical concepts of goodness-of-fit and differential susceptibility. These imply that, where parenting is concerned, one size does not fit all. 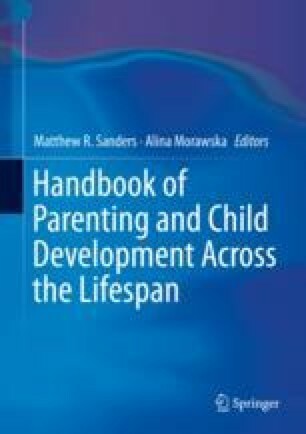 It also discusses how parenting is related to child age, gender, and chronic illness, again indicating the need for parental responsiveness to child individuality. The relatively small number of well-evaluated parenting interventions which focus on child temperament also confirms the potential benefits of helping parents take child characteristics into account. The chapter identifies deficiencies in current research, including the common failure to take the child’s broader ecological context into account, the dearth of research on non-Western and non-middle-class samples, and the lack of attention to fathering. It concludes by noting the importance of avoiding recipe book approaches to parenting and rather supporting parents to adjust their parenting to fit their particular child’s characteristics. Huerta, M. C., Adema, W., Baxter, J., Han, W., Lausten, M., Lee, R., & Waldfogel, J. (2013). Fathers’ leave, fathers’ involvement, and child development: Are they related? Evidence from four OECD countries. OECD Social, Employment and Migration Working Papers, No. 140, OECD Publishing. doi: https://doi.org/10.1787/5k4dlw9w6czq-en.